I couldn’t think of a more fitting photo that honors peace than this one above. 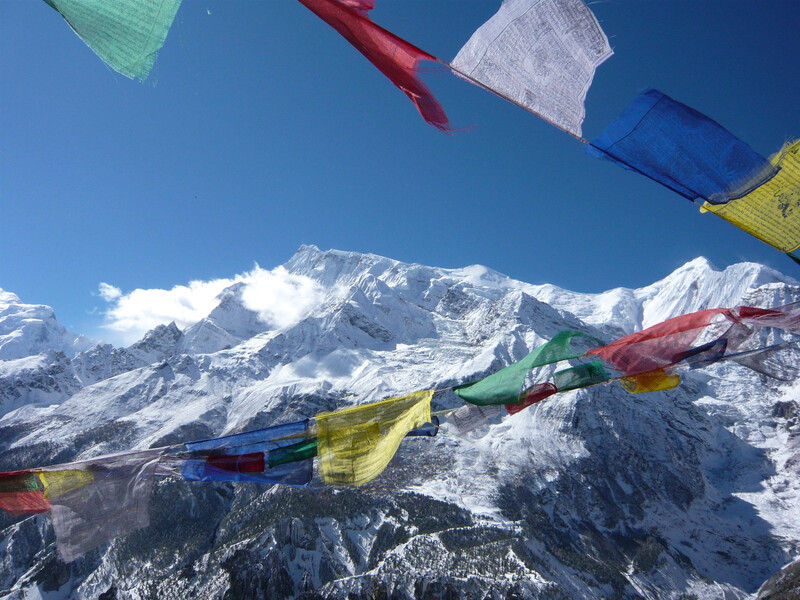 It was taken while hiking in Nepal and the white from the fresh coat of snow and the glittering prayer flags both symbolize peace. What kind of world will we become if we don’t live in peace? What kind of future will our children and grand-children have? A world without peace is a world not worth living in. This post is in honor of the UN’s International Day of Peace and was prompted by Where’s my Backpack’s travel theme: White. To read more entries, click here. What a lovely Friday tribute. Tonight, I am looking forward to 33 more hours of work in the fiscal year (!!! ), the arrival of JWF (!! ), and my final 20-mile run prior to the marathon (!). Thanks Jo! I love your gravator by the way. Is it relatively new? Yep…it is a shot I took of one of the kitties. I wouldn’t say a world without peace is “not a world worth living in.” I certainly think this World is worth living in and it’s not peaceful. But still, great post. Don’t want to sound a cynical because I actually like this a lot. I am reading The Snow Leopard, by Peter Matthiessen now, which is all about Nepal and Spirituality. So it strikes a great chord! The picture is, of course, just gorgeous. That’s true. I guess I meant more “my world” than the world as a whole as yes there isn’t peace, there is so much fighting and suffering. But I’m at peace. I have heard that the Snow Leopard book is amazing! Someone else recommended it to me. I will have to read it and put it on my list! Thanks for the comment! I love this photo Nicole! You can almost feel the crisp coldness! By the way, I read the Snow Leopard years ago and loved it. I highly recommend it too and think it’s time for me to search it out again! Aw thanks Nicole! I can’t wait either. It’s so frustrating coming from a third world country, where I had a fantastic internet connection, to the UK where there are still areas with poor or no mobile internet signal!